As with so many other State uniform overhauls, it was a National Carnival that triggered this new design. 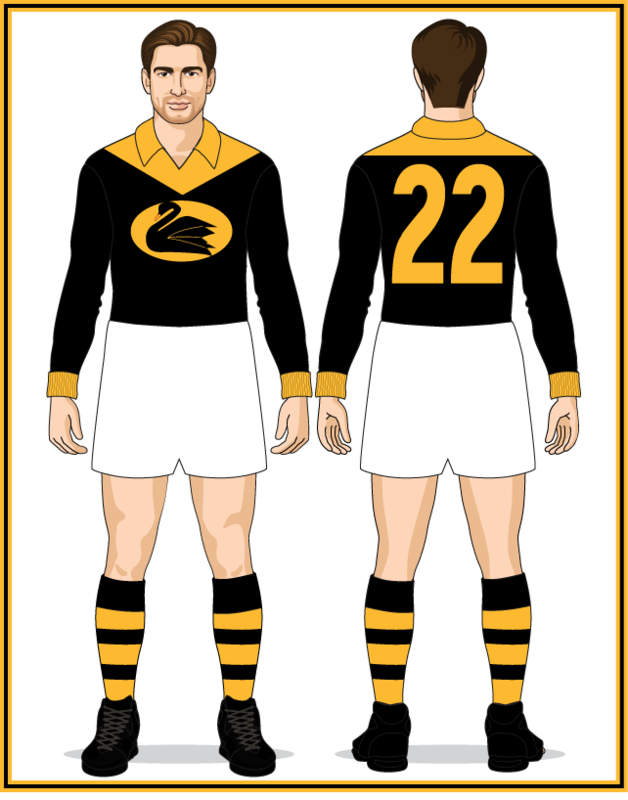 For the 1958 Melbourne carnival Western Australia ditched their gold jumpers in favour of this black design. The swan remained the same as the one worn since 1952 but was a little smaller due to the football-shaped oval it was now placed within. 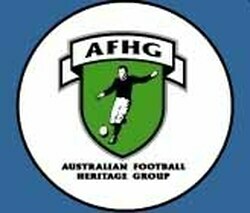 The socks reverted to the same design worn 1952-55. 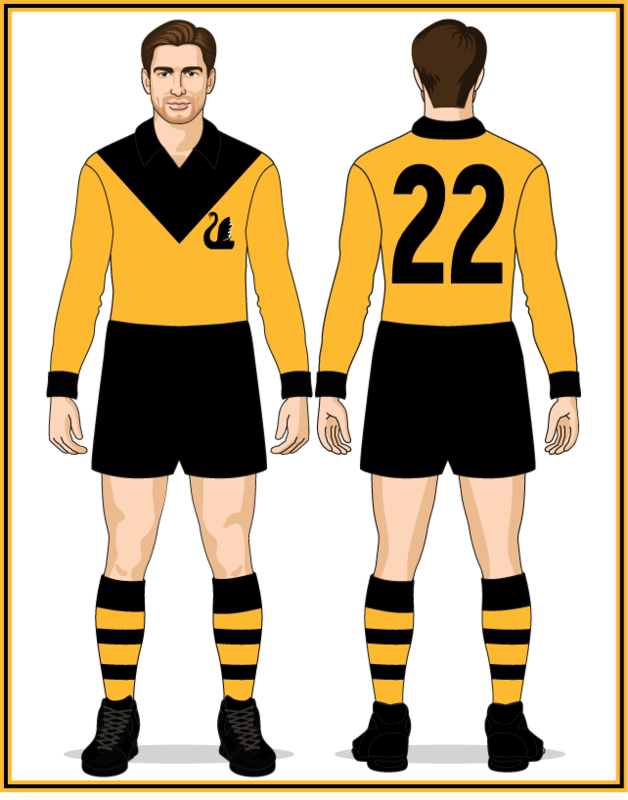 As with previous designs this jumper was usually worn with black shorts against Victoria (as well as against the VFA in 1958) but in 1962 the West Australians took to the MCG in white shorts; the first time the Victorian side had worn coloured shorts since 1932. With the increasing popularity of sleeveless jumpers at club level, Victoria and South Australia switched to sleeveless designs for the 1961 National Carnival. In response Western Australia introduced the above jumper in 1962; their first sleeveless jumper since 1939. 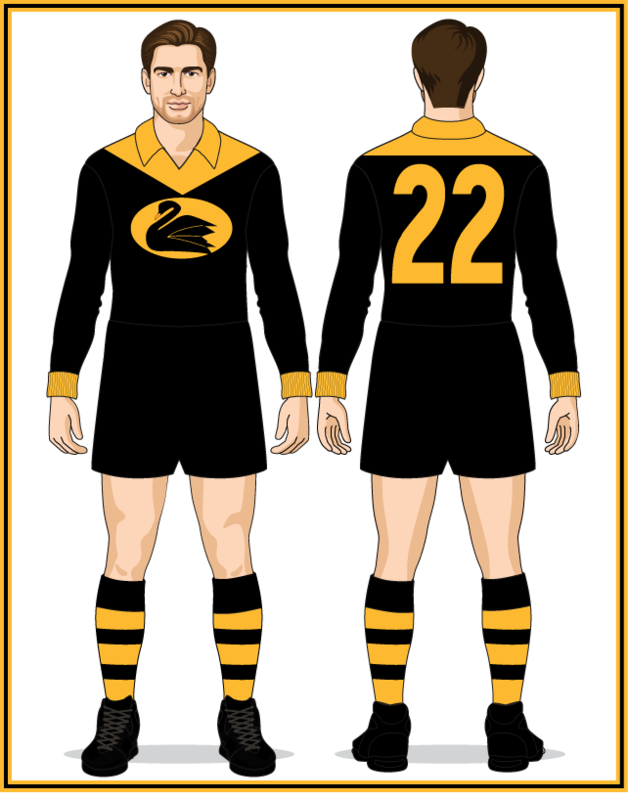 It continued to be worn alongside the long-sleeved version until the black uniform was phased out after the 1963 season. 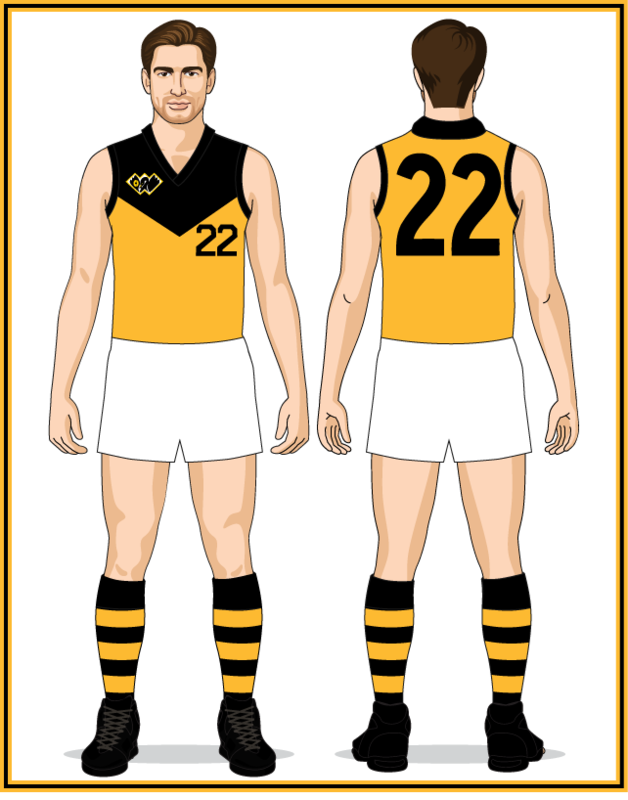 This design was basically an inversion of the previous jumper, with the yoke now black and the jumper gold. The biggest design change was the introduction of a new swan. It was the smallest to appear on the State jumper since 1926 and the first to be worn off-centre. 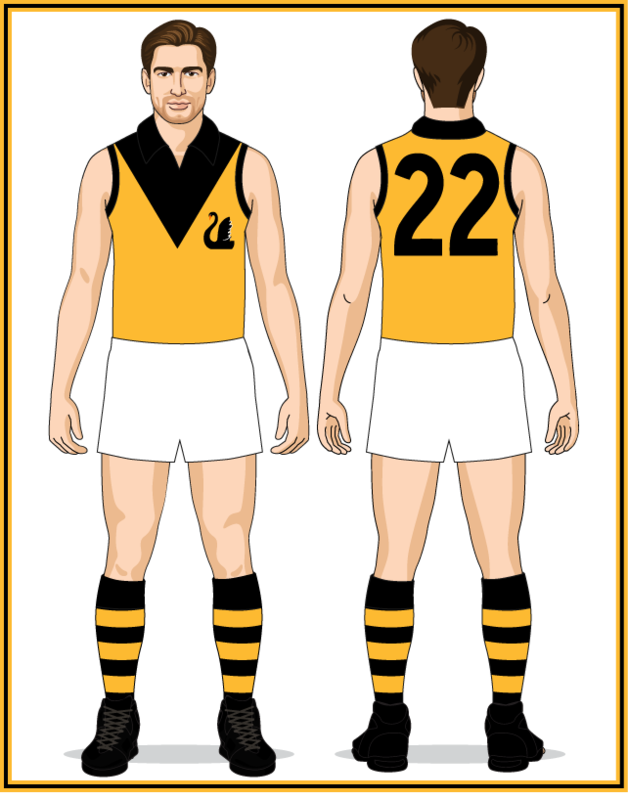 The start of the 1960s saw sleeveless jumpers introduced at club level and at State level Victoria and South Australia quickly joined the trend, switching to sleeveless in 1961. 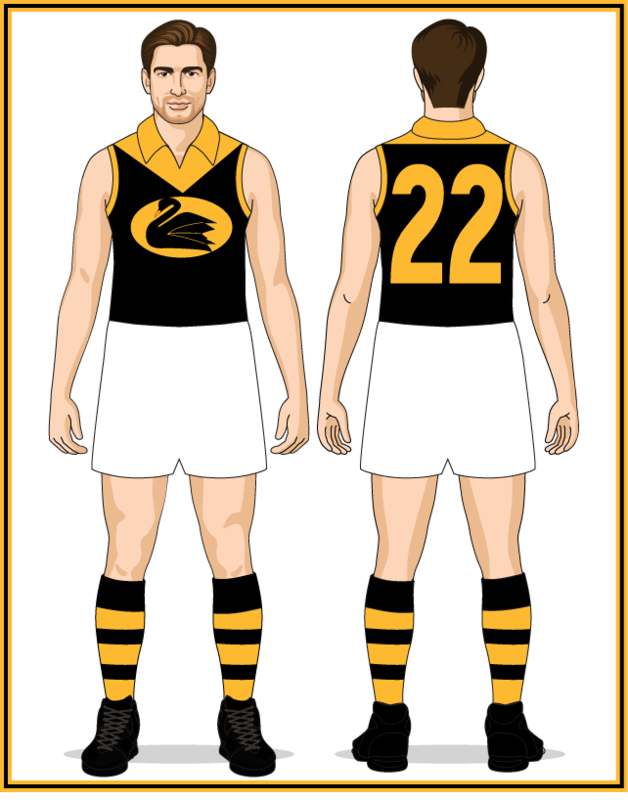 Western Australia had trialled this jumper-type in 1962-63 but it was not officially adopted until 1967. 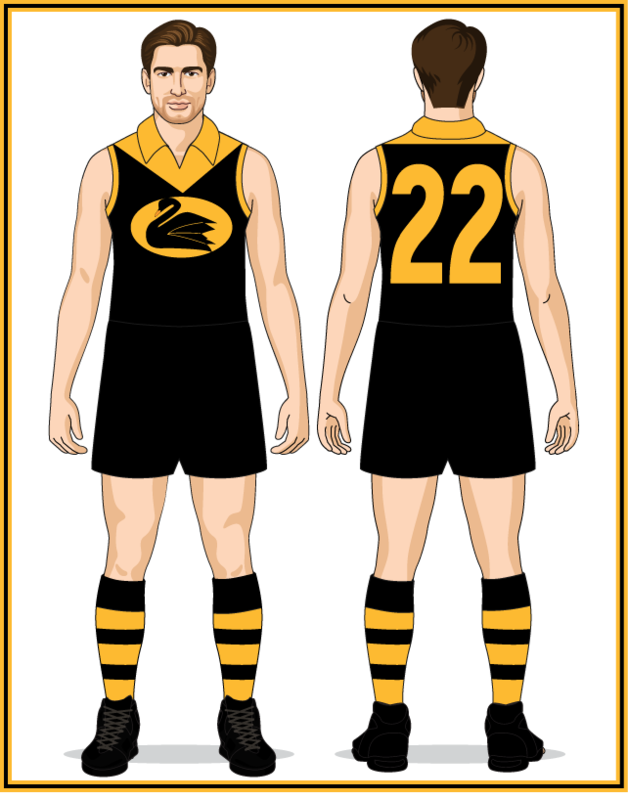 This drew the curtain on the age-old practice of WA State players slicing the sleeves off their long-sleeved jumpers on hot days and from this point onward sleeveless jumpers became the standard, with the long-sleeved versions only being issued on request. The shorts were modified from the baggier variety introduced in the early-1930s to the tighter-fitting style popular throughout the 1970s-80s. A variation on the previous design that had been worn since 1964 but the yoke didn't descend as far down the front of the jumper. This was the first design to feature the small numbers on the front that would quickly become synonymous with WA State jumpers. 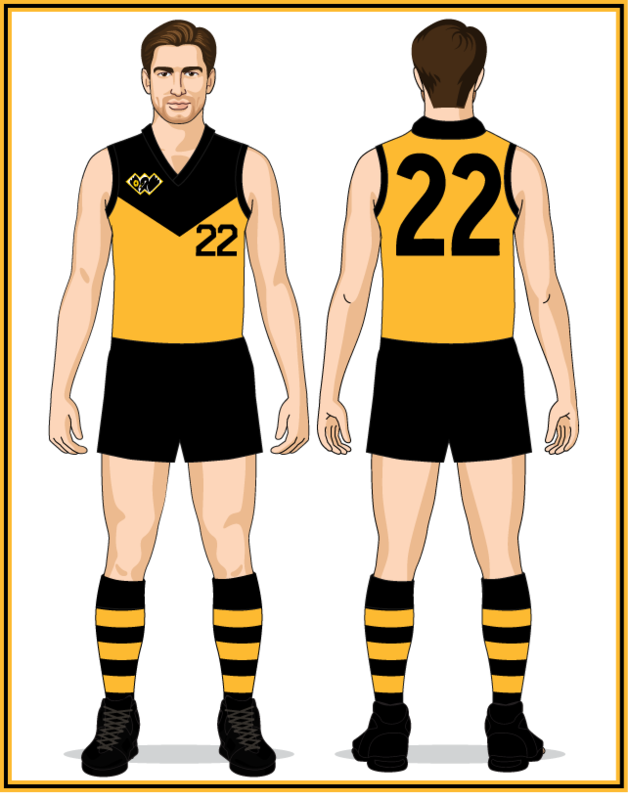 It was also the first to feature the new WAFL logo on the jumper front.